Michigan lily (Lilium michiganense) growing near the Snake River in east central Minnesota. They are a gift of wet years, often not blooming in summers of little rainfall. 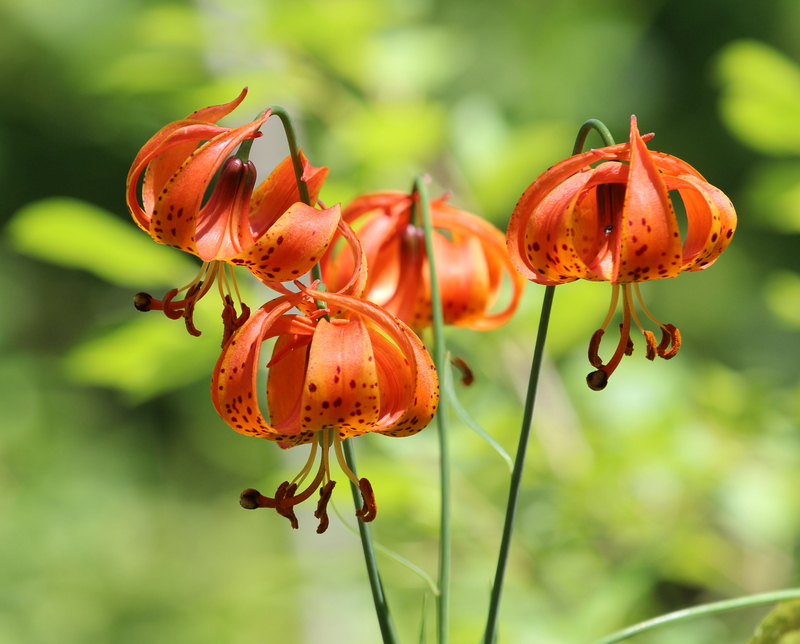 Native to eastern North America, the Michigan lily’s (Lilium michiganense) delicate tepals curve up and backward, setting it apart from most other native lilies. They range in color from light orange to red-orange and are speckled with purple. The closely related Turk’s cap lily (Lilium superbum) is almost identical in appearance. Turk’s caps can sometimes be distinguished by the presence of a green star in the flower’s throat, and anthers longer than 1/2 inch that are colored magenta or darker. It is native to areas south of Minnesota, but has been widely introduced here. Both lilies grow from a bulb, reach a height of four to seven feet, and form thin, tiny seeds in a pod. When our son was little, one of the first things he did when we arrived at our cabin was to check all of the damp spots where we’d found Michigan lilies in previous years. They like “wet feet” and grow in moist right-of-ways, near drainage ditches, and edges of woodlands along the Snake River in Pine County, MN, and other streams. He delighted in finding them, and I was excited to find many in bloom last week. The tepals curve up and back toward the base of the flower. Hummingbirds, sphinx moths and butterflies, such as monarchs and fritillaries, are attracted to the reddish blooms. I’m attracted to them for a different reason. I think of light, joy and life when I see them glow so deeply in the morning sun. Both types of lily are becoming more uncommon in the wild due to roadside mowing and cultivation. If you spot these lilies growing on your property, please let them stand undisturbed until the plants become dormant in the fall. 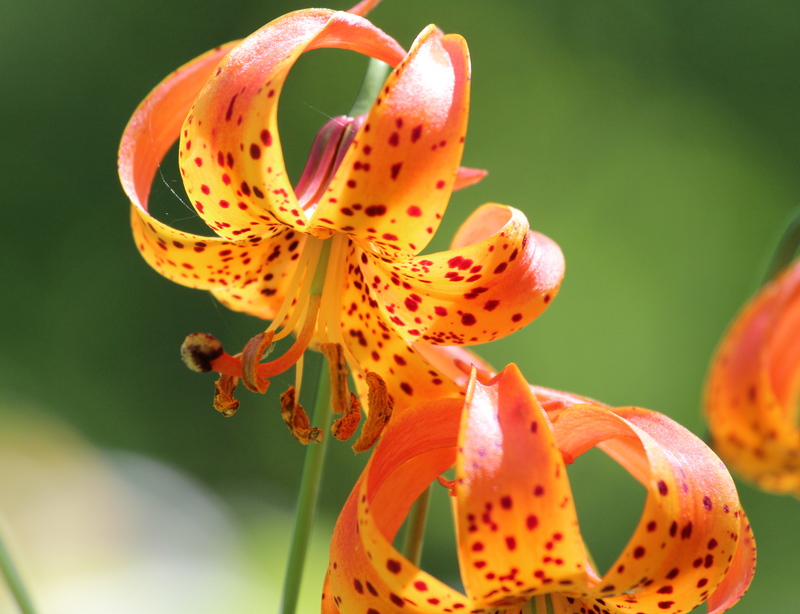 This entry was posted in Nature Photography, Pine County, Snake River, MN, Summer, Wildflowers and tagged Michigan lily, Minnesota native lilies, Turk's cap lily. Bookmark the permalink. Your pictures are beautiful. It is fun to “see” everything through your eyes! Hope your summer is going well. It really is the perfect mix this year of rain and heat to set our hearts alight with all the colors in the garden!